All dogs are high maintenance and feeding and thinking about Labrador Retriever nutrition isn't easy for an owner at any stage of the dogs life. In my personal experience all the Labs I have owned have been the most picky of eaters. Any tasty treat is devoured in an instant but when it comes to meals every Lab I have had has gone through stages of liking and then disliking certain foods. Of course one of the main problems is in choosing the food with which to feed your dog. The UK and US, and everywhere else in the world I imagine, is awash with varieties or dog food with endless commercials on TV and in the press telling us we are irresponsible owners if don’t feed Fido with the all new, all singing and dancing dog food that has just being released on the market. In the case of Labrador Retriever nutrition most breeders recommend feeding your dog with a high quality dried dog food though just as many owners will tell you that to ensure your dogs diet is as nutritious and as delicious as possible you should prepare your own food. Whichever kind of food you decide is best for your Lab, and your breeder or vet will be only too happy to offer advice, if should be remembered that there can be such an issue as too much of a good thing. For more information on this visit our page on the best dog food to feed your Labrador Retriever. 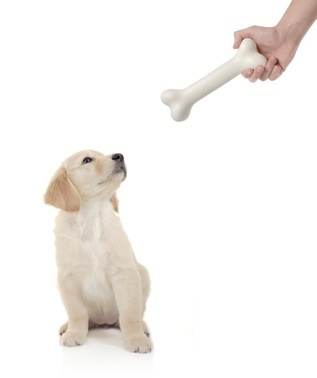 Too much protein or calcium can lead to problems in the joints of dogs, especially puppies. Too many vitamins or other additives can also lead to problems for puppies. When thinking about Labrador Retriever nutrition it should be remembered that all dogs are carnivores. No matter how that may go against the principles of the owner; a Labrador is not, will not and should not be vegetarian! Most dog food on sale in supermarkets contains some vegetable elements but your Lab will be able to cope with this as the harmful cellulose in the veg will have been dissipated in the preparation process. High quality dog food will contain the right balance of protein and vitamins etc whereas cheaper or budget food may not contain the required nutritional value that your Lab requires to remain healthy and active. Preparing your own food is a great way to ensure your dog is receiving the correct diet but how often should you feed your dog? If you ask your canine friend he would reply as often as possible but over-eating is often affects Labrador Retriever nutrition, so regularly inspect your dog too make sure he’s not putting on too much weight. Ideally your lab will have good muscle and bone development and be fleshy without being fat. If he’s alert and active than you can rest assured that he is getting the right amount of food. If your dog is getting fat put him back on a balanced diet; an overweight Lab will become very poorly very quickly and will inevitably suffer from orthopaedic problems.